At All-ways Rigging Gear, we have a huge range of hoists and winches for a variety of uses and purposes. The range includes chain hoists, lever hoists, girder trolleys, electric hoists, electric winches, wire rope winches, hand winches, hydraulic recovery winches plus much, much more. With a huge range of winches and hoists, All-Ways Rigging Gear has a solution for all your heavy lifting and transport needs. As a specialist supplier, All-Ways Rigging Gear stocks the world’s leading brands of hoists and winches. 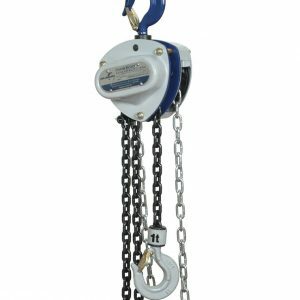 The All-Ways Rigging Gear range of chain hoists features super strength alloy loadchain, lightweight robust construction, fully enclosed gear train and these hoists require minimum headroom. We sell the ‘S’ Series and Loadsafe Chain Hoists which have a capacity of 500kg to 50 tonnes. The Vital Chain Hoist has a capacity of 500kg to 20 tonnes. The Lever Hoist range varies from hoists that have capacities of 250kg to 500kg up to the Ozblok Loadsafe and Vital Lever Hoist with capacities of 750kg to 9 tonnes. All-ways Rigging Gear also sells electric rope hoists – ideal for use on construction and building sites. They are also handy in factories and storage spaces. For serious heavy lifting jobs, there is the PTI Series – JDN Flameproof Air Hoist which has a capacity of 500kg to 125 tonnes. This model is particularly useful in environments where flammable goods are being transported. It is one of the most cost effective ways of lifting heavy goods above or below ground and is known as one of the safest hoists in the industry. 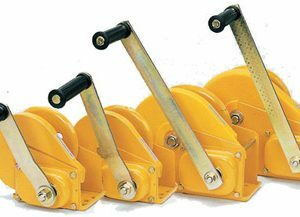 All-ways Rigging Gear also sells brake winches that lift, lower or pull between 200kg to 1250kg. These winches have a removable handle and a self-actuating brake mechanism for safety. They are made from materials that are protected against corrosion. For jobs that require a winch that can be used in a horizontal, vertical or angled position – All-Ways Rigging Gear has a good selection of Tirfor wire rope winches. The range includes wire rope winches with capacities of 800kg, 1600kg and 3200kg. These winches are lightweight, portable and feature a compact design. They’re made of corrosion free alloy steel plate and feature a chrome finish. All-Ways Rigging Gear also stocks cost effective winch solutions, such as the Pacific Load Hand Winch.